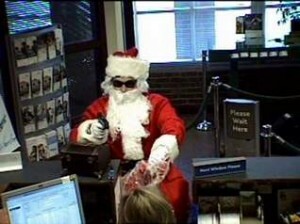 What’s a Christmas season without some guy dressing up just like Santa and robbing a bank? On Tuesday, a Santa with gun in tow, robbed the SunTrust Bank at 4809 Old Hickory Boulevard in Hermitage, Tenn., according to the Tennessean newspaper. The paper reported that the guy then fled in a gray mid-sized car that had been parked in a nearby church parking lot. Posted: 12/23/09 at 8:44 AM under News Story.